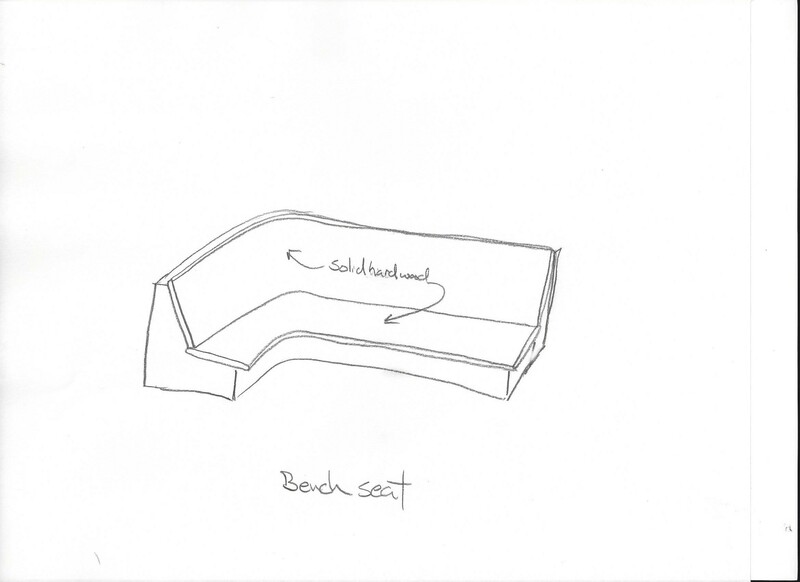 I'm doing a kitchen for a longtime client who would like to incorporate a booth/ bench seat area made of hardwood[see attached sketch ]I'm not capable of fabricating the sloped curved back required for this so I'm looking for some one to outsource this component from . Any suggestions ? Species? Solid or ply? Grain direction? Are the 3 basic info requests I would have first. Do your client a favor, and talk him or her out of that part. It will likely be lost behind cushions anyway. Why make life harder than it needs to be? Species hasn't been selected yet but prob a dark stained domestic ,grain direction doesn't matter but I would assume it needs to be vertical to make this work. Client wants the look of a wood back not upholstered. "...why make life harder than it needs to be..."
Now there's the joke of the century. Lots o' ways to make something bearing resemblance to that sketch. Dial in the design, and you'll get some help with a source. How about the entire back made of staves? In the corner they would taper. If you would rather a premodern corner component of ply/veneer, then perhaps contact a veneering company that makes cone shapes. "Veneer services unlimited"(john costin I think is his name) in Maine is one that I have spoken with. I'm sure there are others. Then there is the option of contacting a company that make restaurant booths for a living. I recently had a 18' u shaped booth to bid. It was spec'd with springs and tufting....I passed. There are others that know this stuff better. I suggest asking them. I would use veneered bendy ply or simply curf cut and then fill veneered sheet good. experiment first as if you don't get the spacing and depth of the curfs right you will see them clearly. Considering that the straight sections of the leaning back are easily enough accomplished the only real issue is the inside corner. There could be a number of ways to accomplish that corner depending upon material to be used. Feel free to contact me once you have some more details on material and I'll come up with a price to construct this for you.